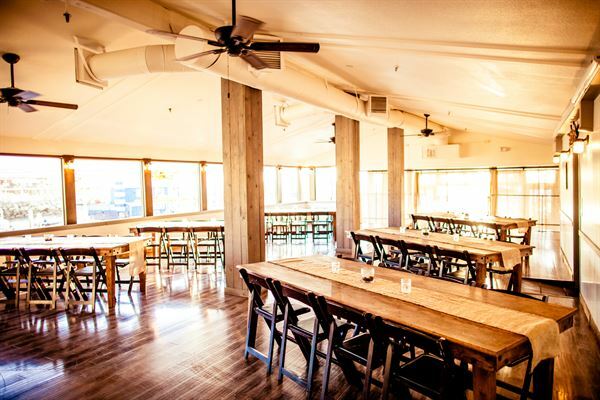 Overlooking the Redondo Beach marina's beautiful set of docked boats, sits a two-story restaurant and event space. Since their opening a few years ago, R10 Social House's floor to ceiling windows and open layout have set the stage for a myriad of possibilities for all special occasions-- from engagement parties to weddings to vow renewals. With two full bars and plenty of seating from leather couches and wooden chairs, every detail of R10 lends to their rustic decor and laid back seaside atmosphere. The second floor consists of natural light shining into several multi-leveled rooms, with the ability to be transformed into any bride's dream vision. Included are multiple tvs, installed surround sound, and high end event lights that add the perfect touch for any videos or DJ setup needed. Walk across the wooden panel floors, out to one their multiple outdoor patios on the lower and upper level, to catch a glimpse of the sun setting over the water or to enjoy the cool ocean air. The intimate settings are perfect for small affairs for up to 200 guests, that can be custom tailored to suit your unique style, from a sit-down dinner to a cocktail and canapé social.